“University City on the Rise”: that’s the dynamic slogan of the city of Garching near Munich. The community is placing a lot of value on quality of life with a city-like rich offering of shops, kindergartens and jobs while maintaining its rural, even village-like charm for its residents. Let yourself be thrilled by the idea of living there one day, where country and city, history and technology, recreation and occupation are all united into one harmonious whole. Discover for yourself what turns Garching from “livable” into “lovable”! 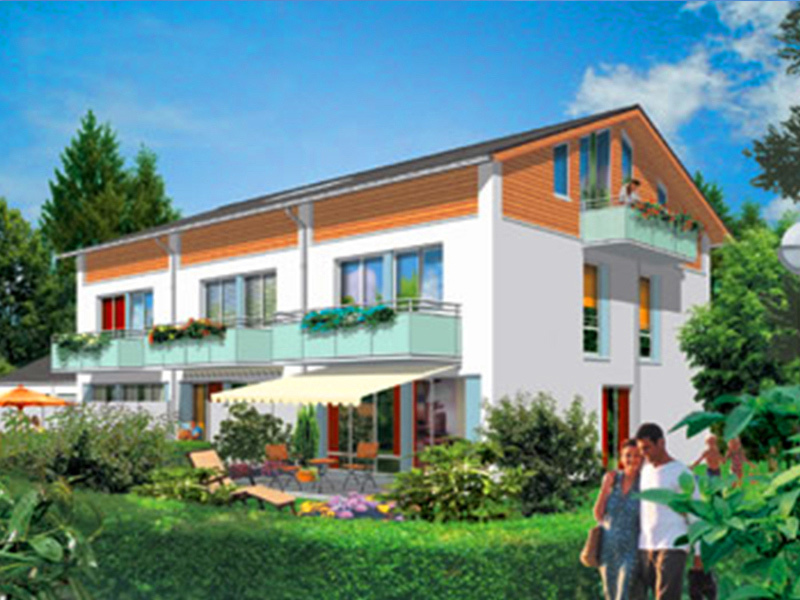 “Mühlbacher Anger" in Garching`s Mühlpark neighborhood: here's a place to truly feel at home! 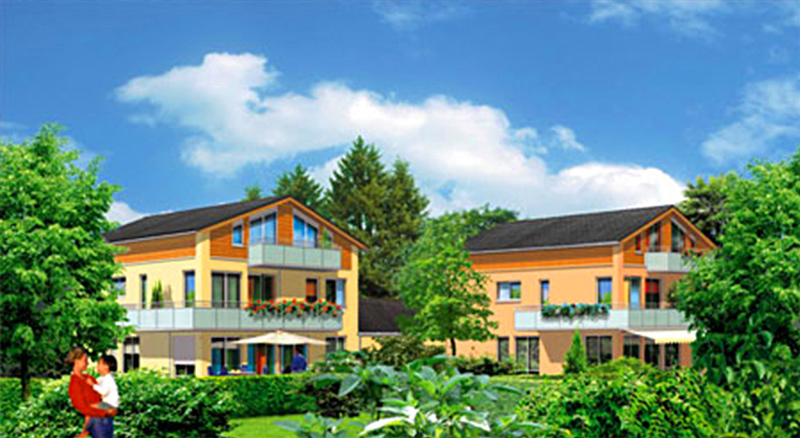 Ideally located on the north side of Munich, convenient for mobility with transport links to everything, and yet lots of nature with its proximity to meadows, small lakes and forested areas. 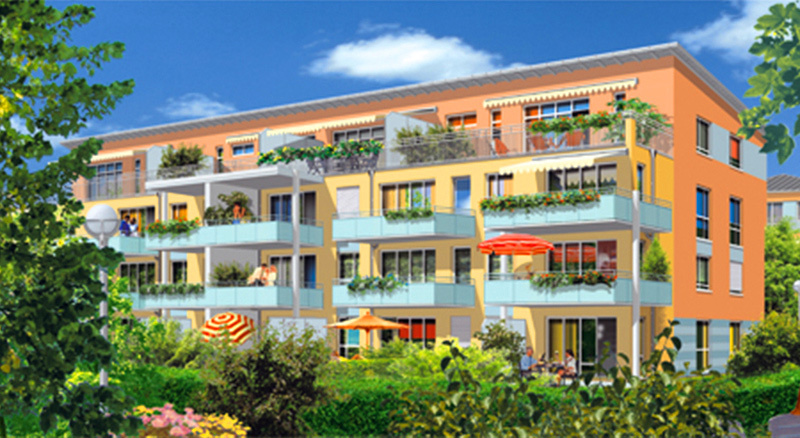 The city of Garching is already a very special and lovely location for your new home. One especially attractive facet is the wide range of options that will turn regular free time into mini-vacations. The most popular meeting place for the people of Garching is the beer garden in the Mühlenpark, regularly visited by both locals and passing cyclists. On the banks of the Mühlbach is a large children’s playground, a spot for rollerskating, and a small outdoor theater all for young guests. One of the cleanest lakes for swimming in the region is the Garchinger See which has a playground and a newly landscaped park. The garden restaurant “Seehaus” is located here to spoil your palate before and after your time in the water. The range neighborhoods in Garching each has its own, growing significance. Garching itself is a dynamic town with plenty of infrastructural facilities. Dirnismaning features major farms and crafts businesses. Hochbrück is relatively new and has a university and large residential and commercial areas – most famous for the Olympia shooting range – and its “Forschungsinstitute” (“research institute”) neighborhood is the high-tech mecca of Munich. With a diverse program of exhibitions, theatrical and music performances, concerts and literary events, the little “Theater am Römerhof” is constantly introducing new highlights to the cultural life of Garching. The new Garching Music School, open to everyone, regularly organizes student recitals and concerts at the “Beethovensaal” and the “Theatron”. An affiliated gallery displays exhibitions of musical topics and houses the collection “Musical Instruments of Different Peoples”. The city of Garching currently has about 5,600 households with around 15,000 inhabitants. Plans for urban development designed collaboratively by the citizens, the city administration and the representatives of important interest groups are committed to the exciting goal of improving the local living conditions and community feeling, and ensuring urban development of a particularly high quality. The plans place special value on high quality residential property built with sustainable methods and designed to save resources. Working and living should be brought closer together and city marketing should provide meaningful support to natural areas and culture. The “Mühlenpark”, at the end of the beautiful Lindenallee, which was built one hundred years ago, is one of the most popular spots in Garching. With its tree-shaded beer garden and large children’s playground, it’s a highlight on hot summer day. And a view to the old mill wheel, which still turns, reminds visitors of the former water mills that once stood along the stream. The Mühlbach, the Gießen and the Schwabinger Bach are the old, natural waterways that characterize the attractive landscape of Garching, along with the “Isarauen”. The man-made Wiesäckerbach and the Überreiterbachl canals complete the relaxing idyll. The “Isarauen”, a protected nature reserve since 1986, along with its surrounding farmed fields, and the “Auwald” – the largest contiguous wooded area alongside the nearby Schleißheimer Forst – make up a biotope with a diverse range of flora and fauna. The town of Garching has special membership in the “Heideflächen-Verein Münchener Norden e.V.,” – an association whose aim is to protect the local heathlands while developing their recreational usage – with Garching having a landscape plan for developing a sustainable heathland. A circular path between the communities of Garching, Ober- and Unterschleißheim, Eching and Neufahrn was opened in 2005. Along the path, 20 different stations were created to explain the local fauna and flora, as well as the cultural and landscape history of the area, in an interesting and varied manner. For example, you can go straight to Munich’s Marienplatz using the new extension of the U6. The new “Bahnhof Forschungszentrum” (Research Center Railway Station) and “Bahnhof Garching” (Garching Railway Station) stops are directly connected to “Garching-Hochbrück”, so you can reach the city center in 20 minutes without changing trains. The U6 leaves every 10 minutes during commuting times, making it a faster and more comfortable alternative to the car for traveling the 14 km to the city center. It doesn’t get more convenient than this: You can reach the A9 “Munich – Nuremberg – Berlin” in a couple of minutes. This is also true of the A99 easterly bypass, and then further on the A8 toward Augsburg – Stuttgart or Salzburg. Flying is the only faster way and if that’s your choice, the Franz-Josef-Strauß Airport in Erding is only 21 km away from Garching, reachable by car on the A92 Landshut – Deggendorf or the nearby federal highway. It’s a short trip from the housing complex to the nearby kindergarten, school and shopping area. Further destinations within the city of Garching are easily reached by bus. The subway station is only 500 yards away and gets you to Munich quickly and safely. The subway has been running to Garching-Hochbrück since 1995. Back in May 2002, work began on extending the track to the north, from Garching-Hochbrück to Garching and then to the “Forschungszentrum” (Research Center). The subway line runs underground through developed sections of the town and above ground in the undeveloped areas. In the fall of 2006, work was completed with a major opening celebration. For the design of the Garching Railway Station, the town held a competition in which 6 motifs of Garching were selected – one of them is the famous “Mühlenpark” and is on display there as a mural. 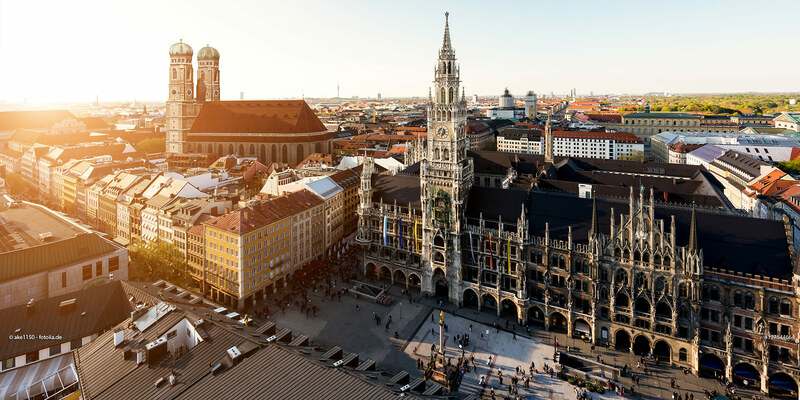 The research universities of Munich feature twelve departmental faculties at their Garching location offering a set of subjects that is unique in Europe to annual intake of 9,000 students. The Technical University of Munich (TU) and the Ludwig-Maximilians-Universität (LMU) are ranked first in the fields of natural science and technology, medicine and life sciences. Since 2004, General Electric has been represented in Garching with one of its four global research centers. Here, 150 scientists conduct research in the areas of medical technology, new materials, automotive and material characteristics. This is the place high-tech calls home. Scientists from around the world come to Garching to use neutrons for fundamental research for the development of new high-performance materials and medications. It’s a center of attraction and the ideal environment for innovative developments in radiopharmacy and semiconductor technology. The “Forschungszentrum” neighborhood has definite plans for further expansion of the location with internationally renowned facilities and is thereby creating ideal conditions to achieve this. A competition to redesign the very center of the district set the course for new projects and an auditorium and communications center, as well as boarding houses for visiting scientists and related infrastructural facilities.